The highly anticipated follow-up to 2011’s High Moor, High Moor 2: Moonstruck continues the story of our protagonist, John Simpson, the ‘moonstruck’ in question, a werewolf who shifts every full moon. He returns for more wolf-on-wolf action as he deals with the fallout from the events of the previous book, which forced him to grapple with shadows from his past, in particular Steven Wilkinson, who is determined to put an end to what his former colleague, Carl Schneider, couldn’t get done. The werewolf cast has also expanded with some returning characters, including John’s former friend Michael Williams, who now works with werewolf elders to ensure that our moonstruck protagonist gets put down for good, as well as Michael’s sister, Marie, who we start off with at the outset. She’s watching over the child of Connie, another werewolf, only to encounter an unexpected rival who turns both their worlds upside down. The werewolves have a strict mandate to ensure that humans never find out about them, something John threatens, making him a high priority target. As the situation changes for each character and they start following some of their own impulses, particularly hot-tempered Scot Connie, tensions escalate and the drama heightens. No one in High Moor 2: Moonstruck is entirely painted black or white, completely good or completely evil. The “good guys” have shades of gray, and the “bad guys” have some streaks of white. Connie’s rampage is on overdrive from the outset, but the reader understands her motives and reasons for doing what she is doing, until she gets to a certain point and commits an act so heinous that it will make even the most hardened horror reader sick to his or her stomach. She is, above all, a monster, and one who knows exactly how to use her abilities to conquer anyone she believes to be a foe, even former friends. Although she goes too far and sets something in motion that will have grave implications for the next book in the series, Reynolds has done a masterful job making her a vivid, believable character. John Simpson is as complex a character as ever, and the seeds planted between him and Marie in the first book have a chance to grow a bit more, adding further complications to everything. Ultimately this makes for a suspenseful, addictive, compelling read that will have the reader racing to the end for the thrilling conclusion. Reynolds doesn’t try too hard or go over the top in trying to reinvent werewolves in a way that some authors feel the need to do, which often produces mixed results. These beasts are the good old-fashioned tear-you-apart, ask-questions-later kind, which is how they should be. 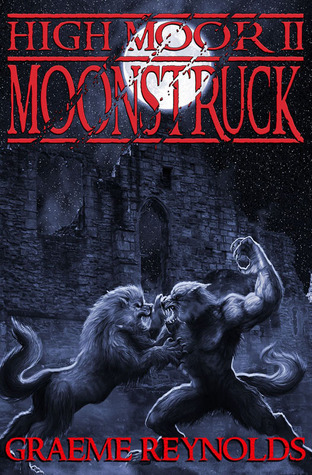 If you absolutely loved the first book, multiply that by 100, and you’ll understand how gripping a read High Moor 2: Moonstruck is–it’s an absolute must for werewolf fans. Horror buffs should have no problem with the graphic depictions of violence, and although it may turn off some readers, getting through the bloody bits and to the real meat of the story is well worth it.